Rising from a peculiar stretch of foothills, just North of the Livid Fens and only a mile from the River Effluent, the Tower of Flints takes it's name from the hills around it, where the turf has been cut down to the grey flint of the hills beneath. The Tower itself is built of the same grey stone, though oddly decorated with crude lumpy statutes of with niches where their faces should be. These niches at one time held white stones or skulls, but most are empty now. The tower is universally shunned as the Witch Queen of the Livid fens has made it known that she will take a personal interest in any who attempts to take up residence within. The tower crumbles into ruins, and it's upper stories have fallen to the North of the base as if torn away by great forces. 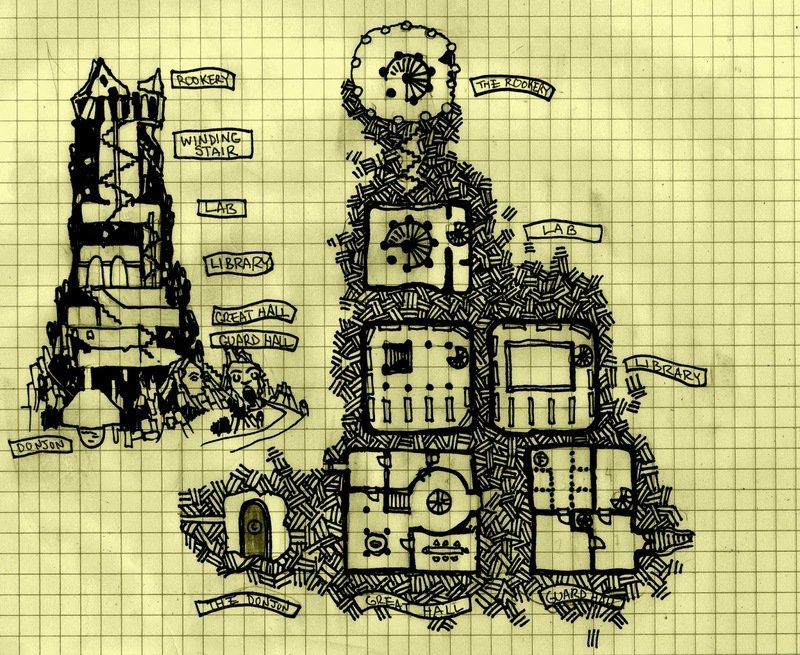 The Tower of Flints is a deserted tower once home to one of the megalomaniac victims of super-science who call themselves 'Wizards' and haunt the Land of 1,000 Towers. It marks the unofficial line between the marches of Denethix and the domain of tribes beholden to the Witch Queen of the Livid Fens. In the South it is known as the Lichethrone rather then the Tower of Flints, though no explanation is given for this difference in convention. Nice map Gus. When I saw it I was all "this is awesome, I need to add it to the map" and what do you know, there's a tower in the exact spot. You might be interested to know that tomorrow night my PCs return to the obelisk to make good on their deal to help the Furter Cultists deal with the Ghouls (actually, the Cleric activated the God's eye, and Furter appeared and ordered them to assist Patriarch Chax so the cleric feels obliged). What they don't know is that when they left for Lugosi to recruit reinforcements I rolled on the 'if the PCs leave' table in the adventure. A group of Hexknights and their peasant militia visited while they were gone, and seizing the opportunity the ghouls have bolstered their numbers with some of the peasant militia. Mwah ha ha. Thanks for more great content. That's pretty good, my ASE game just finished the Obelisk. Massacred the ghouls (moktars are melee nightmares), decided to work with Charx and then killed Torpo. They are contemplating heading South into the Livid Fens now.